It's Sunday and I pray that it's a blessed one for you. It's also time for another challenge at Sentimental Sundays! This week we our challenging you to "Feel the Love" and make something for Valentine's Day or someone you love. The base of my card was made with Poppy Parade cardstock from SU. I used some really old designer paper from The Angel Company and the colors seemed to match up well with Poppy Parade and Chocolate Chip from SU. I would have never thought to put these two colors together if they were not already combined in this paper but, I love the end result! I matted my designer paper with Chocolate Chip and then ran them both through my Cuttlebug with the Hearts embossing folder. My image and sentiment are from Sweet N Sassy Stamps. I stamped my image on Whisper White cardstock and then I sponged around the edges with Antique Linen Distress Ink. 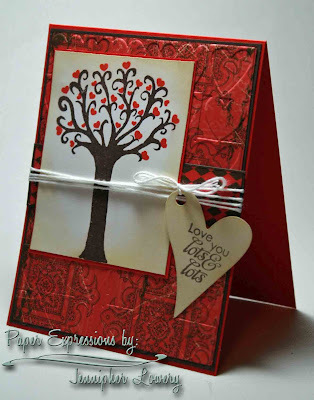 I used Whisper White again with a Heart Tag Sizzix Sizzlits Die. I completely sponged over it with Antique Linen before stamping my sentiment on it. Then I wrapped some baker's twine around the panel and through the hole in my tag to secure it to the card. I know that many of you have jumped on the baker's twine bandwagon however, I had not tried it until today. I can see why everyone likes it so much. Valentine's Day is right around the corner so, "feel the love" and make something for your special someone and come join us at Sentimental Sundays. Be sure to stop by the Sentimental Sundays blog for more inspiration from the Design Team. Thanks for taking the time to stop by my blog today. God Bless You. sweety, this is so lovely and cute! What a lovely card. That tree sure is a neat one! Gorgeous card, love the colour combo and the way you embossed the panel. The twine looks great with your little sentiment heart tag. It's goegrous Jennipher - love the embossed layer and the colours. Jennipher, this is just lovely! 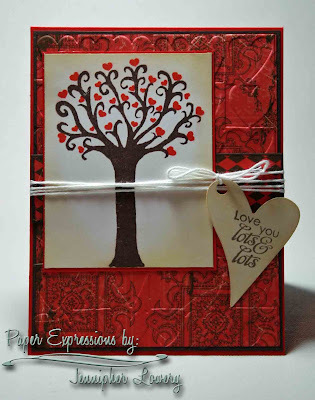 LOVE that wonderful DP you used and the way you did the twine with the heart attached is super! Fabulous card! I just love how the red pops and the heart is adorable! Beautiful job. Love it all. I love your card lots n lots!!! I am feeling the love with that embossed background, Very nice. Thanks for visiting and leaving love on my blog. Love this card! 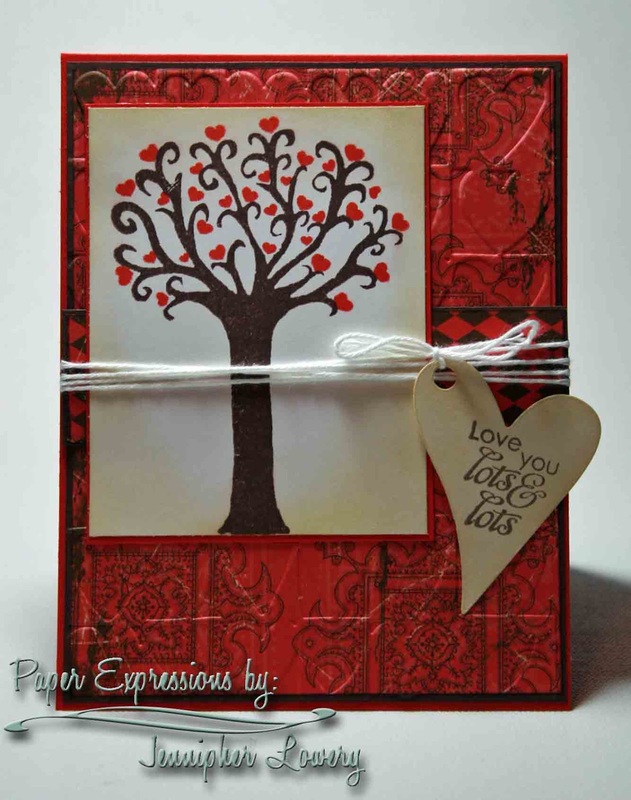 The embossed background is so pretty and I love the heart tree! What a beautiful card Jennipher! The colors are gorgeous & design is great...nice work as always Hun & TFS!!! Beautiful card! I love the heart shaped tag. This is gorgeous! I love the way the embossing looks on the patterned paper. Gorgeous card Jennipher,I love those papers and love the heart embossing on it too! Absolutely lovely. I really like the embossing.